I’ve spent in Tuxtla Gutiérrez, Chiapas in Mexico 12 days. Not very entertaining time, I must say. Mostly work. 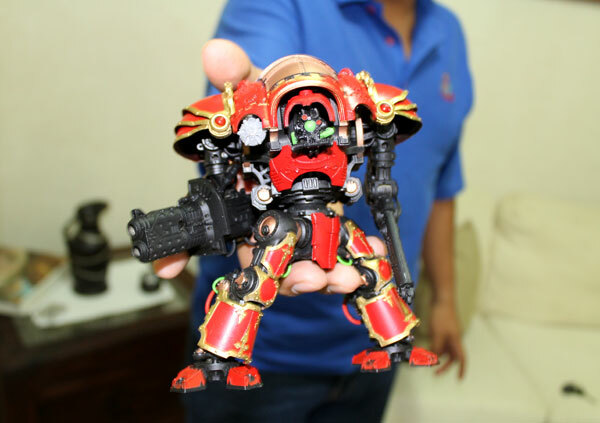 One super adventurous excursion to Canyon Sumidero, and beside that nothing special… expect… I had nice meet up with the guys from local Warhammer 40k Club. I had very pleasant Friday afternoon, chatting and playing small, almost skirmish game of WH40k. In one of the previous posts I’m writing all about it. At first, the plan was to meet these guys and that’s it. Our extended stay in Tuxtla Gutiérrez allowed me to arrange one more meeting, in following weekend.We supposed to play Warhammer 40000 again (btw. 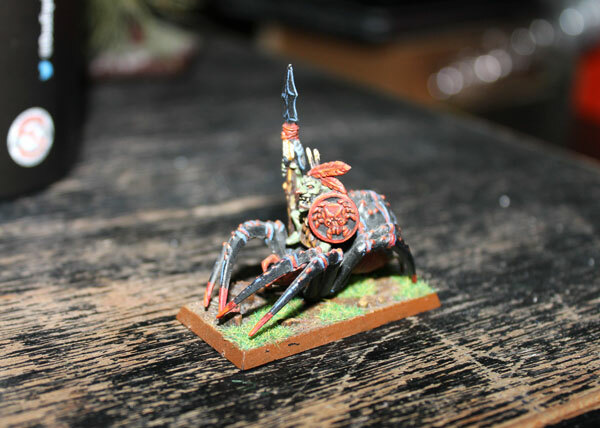 thanks again to guys from the club, allowing me to use their miniatures for battle, I really appreciate it), but I think they were truly concern, when I was telling about my admiration for Warhammer Fantasy Battle, and small change has taken the place. Instead of usual every-weekend meeting cafeteria, we went to the home of one of the Fantasy gamers. 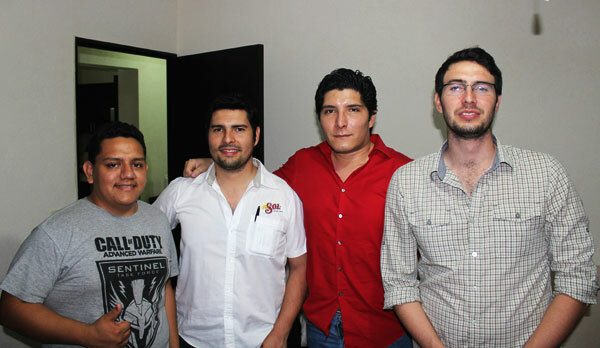 I haven’t complain about – after 40k, I was very eager to meet some WHFB gamers from Chiapas. From Huatulco to Cancun…Tuxtla is on the way. …and more scenery (don’t mind the griffon with no tail;). They were quite a few boxes like that here! The club name’s Warlock’s Lair. At least Eduardo told me so:) His brother denied, and simplified: no, no, it’s just Warhammer Fantasy Club Chiapas, simple as that ( but Edurado whispered – I prefer to call it Warlock’s Lair…). 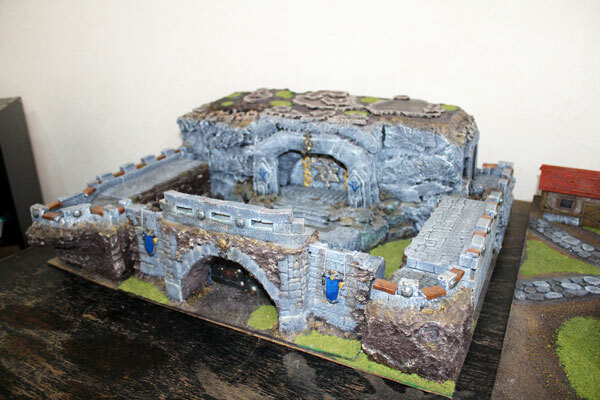 Yeah, I can agree on that – Warlock’s Lair sounds definitely cooler:) If you reading this, my Tuxtla Gutiérrez friends, stick to that name – it suits to the hobby room. The club exists for 12 years now and has 9 members at the moment. Right now, it’s more like casual group of friends than regular club. There’s no fixed place for battles, no weekly or even monthly meetings – only irregular, when the players want to play. Just like that. 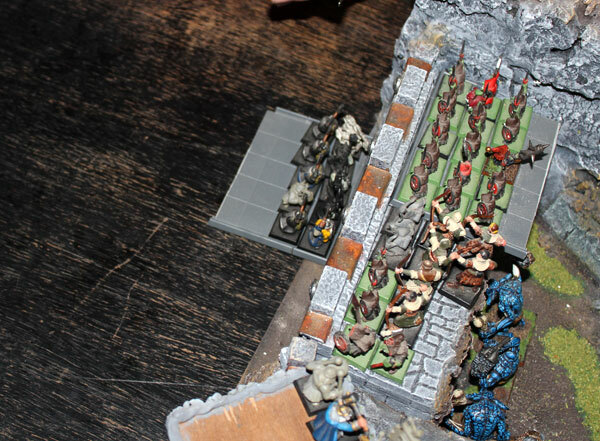 It’s no surprise – after 12 years of playing Warhammer, the pressure goes off – it’s more about fun than win. And battles become more of excuse for meet the group of friends. I can relate to that 100%. No matter what, the war spirit is still burning though – even after 12 years of gaming. Orc Shaman on the Waagh! Totem. 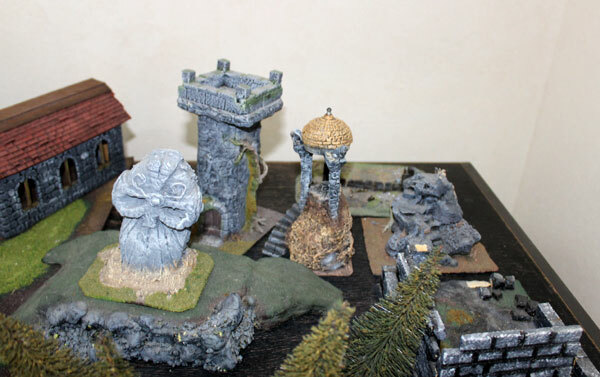 They outsource painting, but also sculpting terrain pieces. Look at this freaky awesome fortress! Dwarf Fortress made by Jorge. 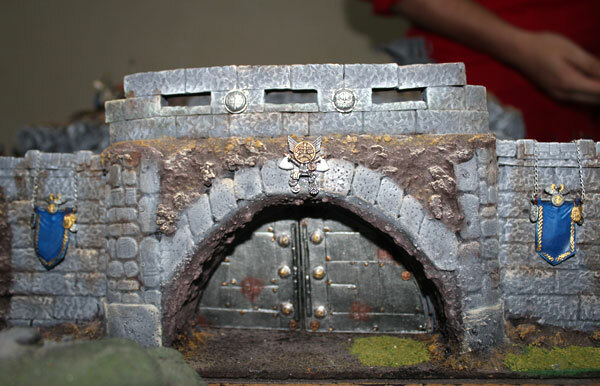 It was made by Jorge, the WH40k player I met last week. 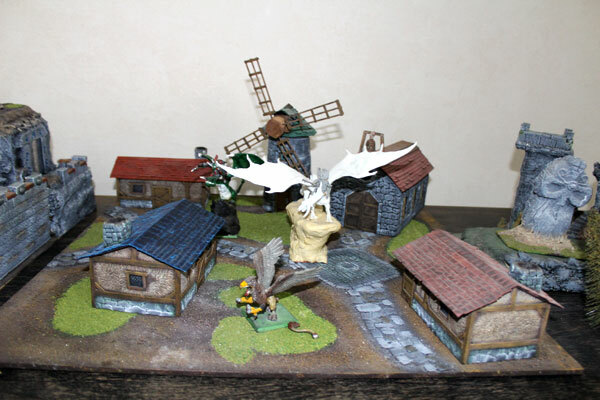 He makes lots of scenery for wargames. Actually, all terrains on posted photos are made by Jorge. He has a talent, I can tell you that. 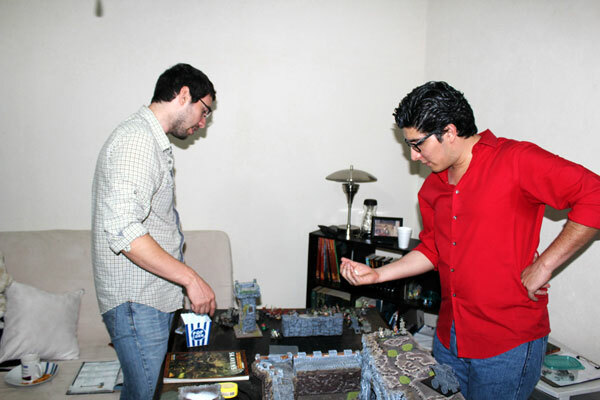 I got to Alberto’s house with Victor – one of the Warhammer 40k players I met a week before. 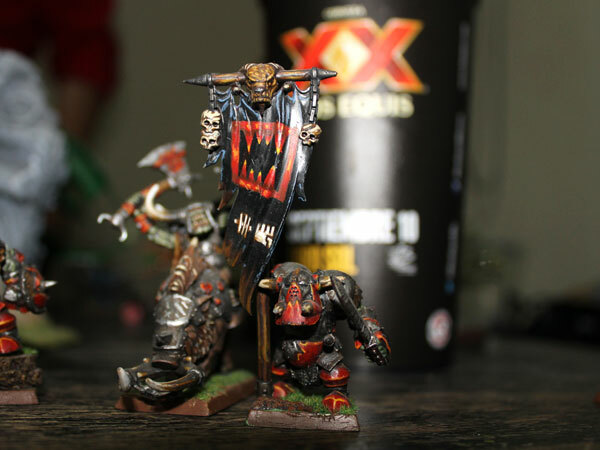 Speaking of Warhammer 40k – I’ve mentioned this before – two wargaming clubs of Chiapas – Wh40k and WhFB are separate. One group play and collect only 40k minis, and the other only fantasy. 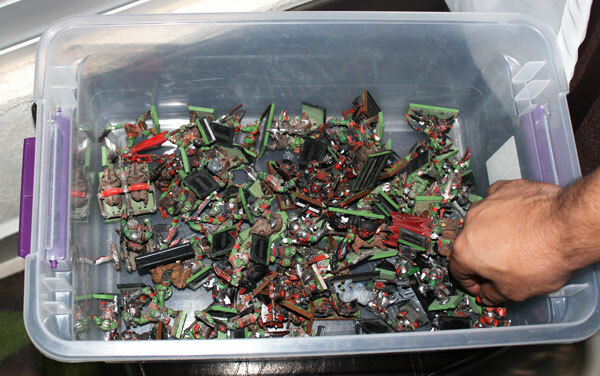 There’s no one of any of the group collect both WHFB and WH40k. Usually they meet in two separate places, but this time they have combined their forces:). We met on the way with few other Warhammer 40k player and off we went to Warlock’s Lair. The plan for the evening was to play two battles simultaneously. 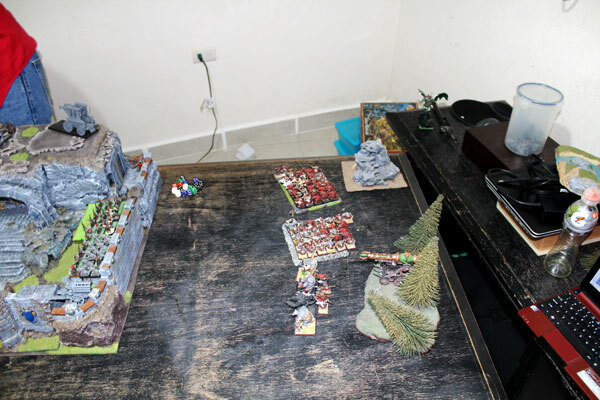 First, Warhammer Fantasy, and at the same time – Warhammer 40k. To be honest, I was totally unprepared to play WHFB this day. I was sure, I will play Warhammer 40k. Instead, I was designated to Fantasy. I didn’t mind at all – but I regret I haven’t brought with me my Skavens! Shame on me! 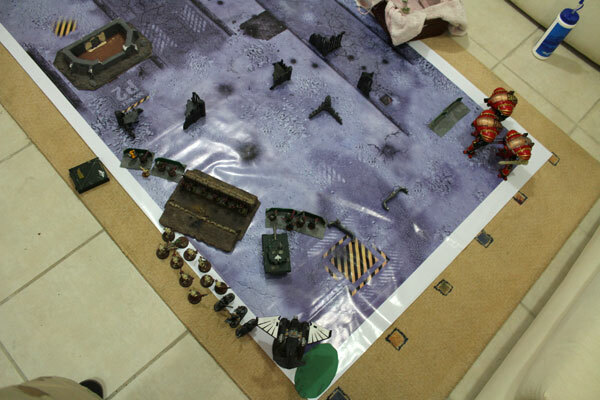 Anyway, in one room 40k players set up their miniatures and have played fairy quick battle. I’m not sure who was playing against who – but I have remembered one thing – Imperial Knights have won. Nicely done! (btw. I have this strong urge to get The Knight in my hands and paint it. I’m pretty convinced, it’s going to happen in very near future – the model is to cool – it is unavoidable:). 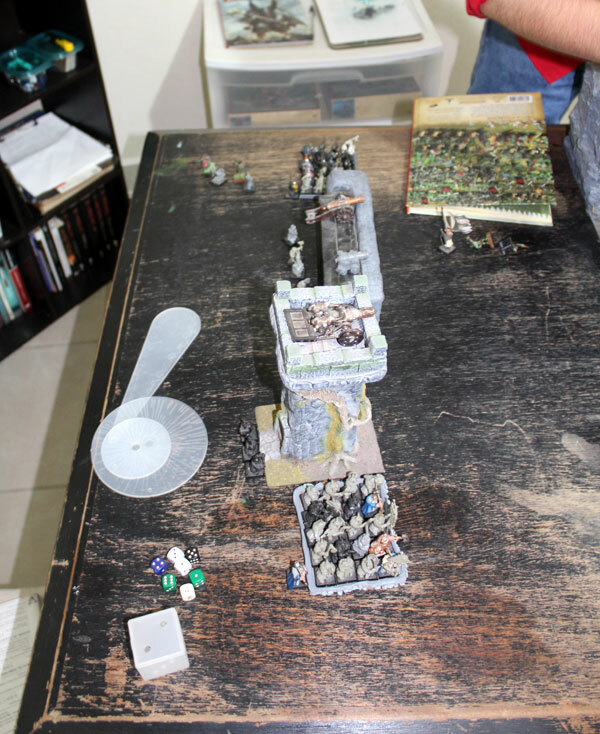 In said hobby room Fantasy battle took place. And this battle was about to be epic. I’ll just give you some small insight (without any final results), and in the very next post you’re about to read first battle report on Game of Travel (I get the jitters:). This mighty dwarf fortress was meant to be included in this battle – it was far too awesome no to do so. Bearing this in mind, we decided to play kind of homemade scenario of siege this stronghold by two armies of 1000 points. 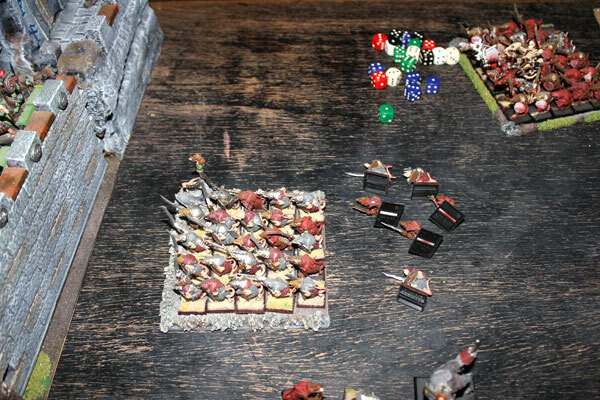 Attacking armies: 1000 points of Skavens (me, me!) 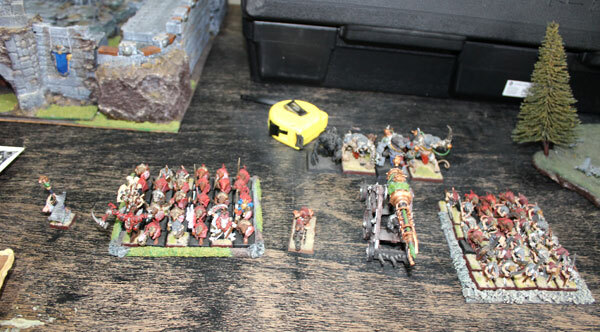 from the east and 1000 points of Dwarfs from the west (lead by Eduardo, trying to retake their claim from…. 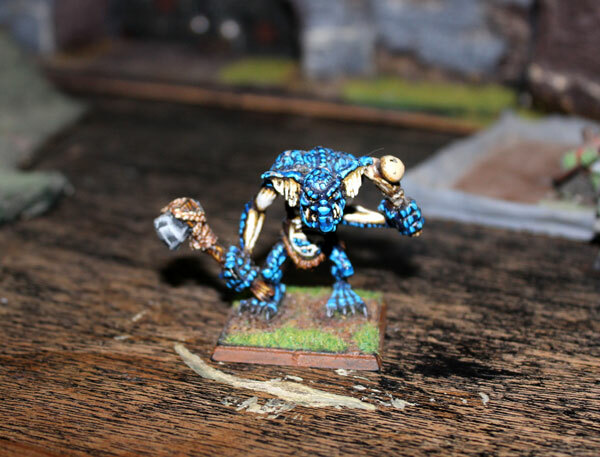 sneaky Goblins (also 1000 points – commanded by Victor, for who it was the very first WHFB battle ever). The idea was, that the players are against each other, but the Goblins are in the middle, so in fact – they were forced to survive two sieges from both sides ( but they had thick stone walls on their side…). Battle was fierce and full of unexpected twists (especially on Skaven side). Blood was shred, rats fled, Dwarfs fell, and Goblins were slaughtered. Who won? I’ll let you know in the next post, when I include full batrep. 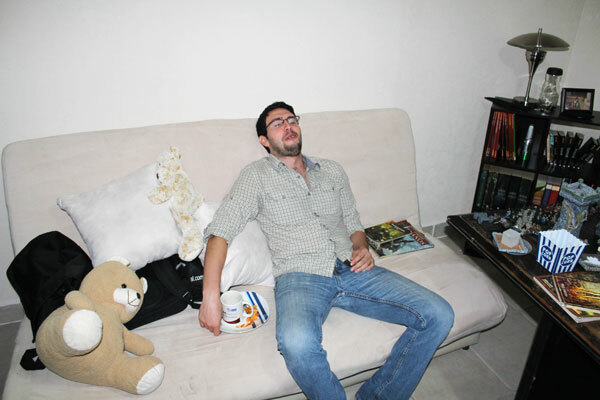 All I can say – It was super fun, and I’d like to say BIG thanks to all the guys from Tuxtla for their hospitality. 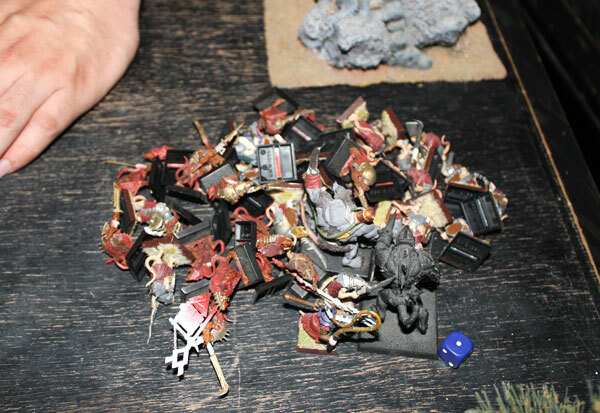 The only thing I regret is, here in Chiapas, gamers use proxy miniatures very often. If they don’t have any model – sometimes they use something else instead (sometimes even only empty base, just to give the idea). On the photos, you may spot some Imperial Helstorm Rocket Battery or Helblaster Volley Gun on the battlefield. No, no – there were no Empire business involved here – they were only proxies for Goblin Spear Chukkas. IMHO, I don’t get that idea. If there’s no specific miniature, there are many other models to put on the army list. But who am I to complain – I was guest there, and I have played by local rules. 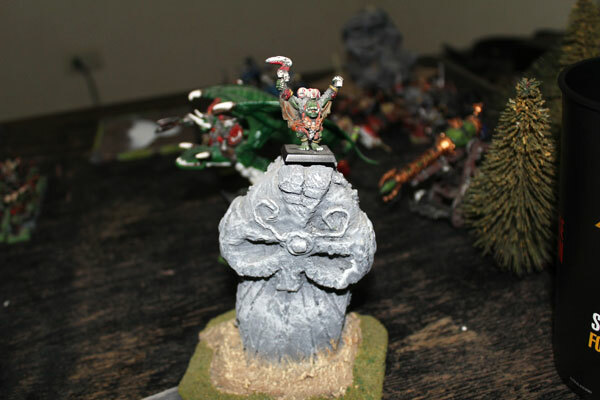 If they said – we use proxies, so ok. Let’s do that (I bend my rules a little too – I haven’t found any mini good enough to be Battle Standard Banner, so I used model of Queek The Headtaker – he looks like he carry some kind of banner..made of skulls). This was enjoyable evening. The gamers are very open, and I’m so glad they were willing to lend me the army to play with them. If anyone of you, by any chance, will be in Tuxtla Gutiérrez, do not hesitate to contact Fantasy players. I guarantee, you will have fun:) To contact the club, go to their Facebook Page. PS. My next stop – Palenque. As far as I’m aware, there are no wargames clubs there, so I’ll have nothing to report there, but in two weeks I’m going to be in Cancun and the local Gamers Den Store. Can’t wait!